Tired of watching money literally go down the drain? You might want to get a new water-efficient kitchen faucet. 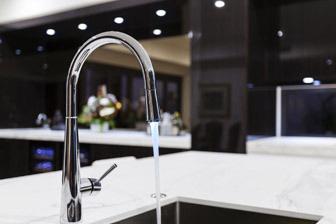 Oddly you might have trouble figuring out which kitchen faucets are most water efficient. That’s because the WaterSense program from the United States Environmental Protection Agency (EPA) only certifies bathroom faucets at this time. But some of the same reasons you would want a water-efficient kitchen faucet are the same as you’ll find for a bathroom.For example, the EPA says we waste as much as 3,000 gallons of water a year brushing our teeth while the tap is on. Imagine how much MORE we waste when we’re washing dishes? That’s why a water-efficient kitchen faucet can make a lot of sense. Verify flow rate.Read the product packaging to make sure that it is labeled as energy efficient. One way to know is to check the “flow rate,” which will be stamped on the metal. A flow rate of 2.2 gpm is optimal. Buy the right size to save on plumbing costs. 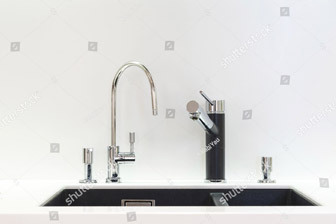 When you replace an existing faucet, your new piece should have the same number of holes for the sink as your old one. Of course, an accomplished plumber can make almost any kitchen faucet fit, but buying the right size replacement can make the job faster. Of course, much of the water we waste in the kitchen is due to how we use the faucet, rather than the faucet itself. Here are some ways to combat that. Don’t let the water run while you scrape plates or load the dishwasher. Fill the sink with hot, soapy water and let dirty dishes soak, rather than using running water. Make sure you turn the kitchen faucet handle hard so it doesn’t drip and waste water. Use leftover (cooled) cooking water to water your plants, rather than fresh water. Get a dishwasher. Believe it or not, a dishwasher uses far less water than washing your dishes by hand. In fact, hand washing can waste up to 5,000 gallons compared to using an ENERGY STAR dishwasher – and uses twice as much energy. This is great news for those of us who don’t love doing dishes. Make the energy-efficient choice and always use the dishwasher, taking care to only run full loads to conserve even more water. Need help choosing or installing an energy-efficient kitchen faucet? Installing a kitchen faucet can be trickier than it looks, but the plumbing professionals at Beaverton Plumbing can help you today. Call us today at 503-643-7619.